A small to medium sized squash with a distinctive crowned top consisting of multiple top knots in white, green and orange colors. The whole squash is often used as a decorative table piece or as a tureen that is filled with squash soup. 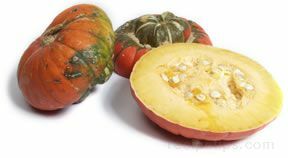 Firm textured, the inner golden flesh has a slightly hazelnut flavor after being baked or steamed. However, it can also taste somewhat bitter depending on the age and the method of preparation. When preparing in an oven, cut the squash lengthwise from the stem to the bottom. Place the squash skin side up in a dish with 1/2 inch of water. Cover the dish and bake for 1 to 1 1/4 hours at 375 degrees. In a microwave, cook for approximately 20 minutes in a dish with a loose cover of plastic wrap. This squash is available year round, but best during August to October.